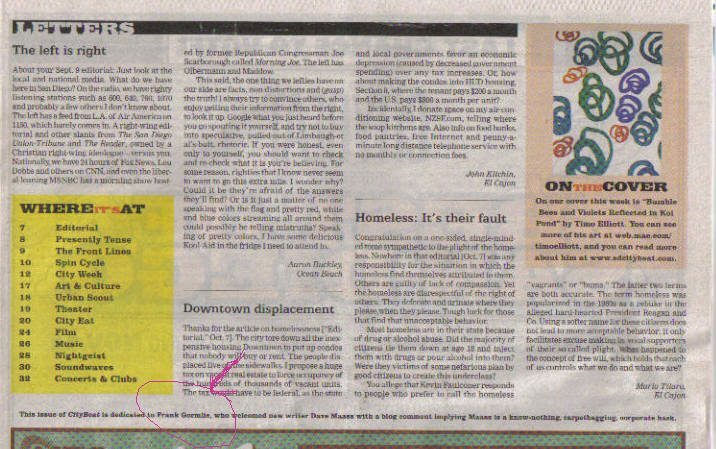 October 21, 2009, issue of CityBeat, dedicated to OB Rag editor Frank Gormlie. I have taken it upon myself to wage a campaign against carpet bagging reporters, flying in to our paradise to take up residency with new, pricey jobs with the growing online news industry here in town. When Voice of San Diego announced recently that they were hiring three reporters from out of town, I gave them all kinds of hell. Why, I asked, would you hire someone from out of town when we have all kinds of good and decent and knowledgeable reporters and journalists right here in good ol’ San Diego? New reporters come in, knowing nothing about our history, the players, the scandals, what’s going on, and have to take months just to catch up. The Union-Tribune itself has laid off all kinds of journalists over the last year, and I’m certain many of them would be happy to move to online news production and writing. Not to mention that the OB Rag has some excellent, experienced bloggers ourselves. But Voice of San Diego would not listen to reason. They hired their “award-winning” newbies just the same. Now, about ten days ago, San Diego City Beat announced that they too would be hiring an out of town replacement for Eric Wolff, one of their writing guys. I hurried to their comments section, and gave them hell too. Although, I never used the terms “carpetbagger”, “know-nothing”, or “corporate hack”, at least City Beat showed they have a sense of humor. Dave Maass here, the new staff writer for CityBeat. I saw your comment on the blog post welcoming me to San Diego and I thought I’d respond personally. I understand the need to remain loyal to local enterprises (whether that’s farmers, businesses or enterprising journalists) I’d like to point out that while I’m not a San Diego native I am a dedicated regional journalism. Many of the larger-picture issues facing California also face the rest of the Southwest: Arizona, New Mexico, Texas and I’ve worked in all three. Furthermore, if newspapers only hired locally, I’d be stuck perpetually in the god-forsaken sprawl of Phoenix. Take pity on me, I had to get out. There’s also an argument to be made that quality trumps localism and I am very good at what I do. At my most recent gig in Santa Fe, my reporting resulted in the indictment of an embezzling Public Regulation Commissioner, the divestment by the state of $45 million in Darfur-tied funds, the rebidding of a family-gouging state prison telephone contract, the defeat of oil drilling in sensitive watershed land, the restructuring of a private security watchdog board, and soon, the authorization of new nonprofit medical cannabis distributors by the otherwise incompetent New Mexico Department of Health to meet an overwhelming demand. In previous jobs, my reporting has resulted in the closing of a refugee camp in Ghana and contributed to the commutation of a Texas death-row inmate’s sentence. I hope my prose also is a pleasure to read. I’d also contend that my background is well-suited for San Diego. I’m well-versed in immigrant issues, refugee rights, the death penalty, energy, development, environmental cleanup, military, gangs and other issues close to the heart of San Diegans. I hope that you’ll withhold judgment until I’ve had a few bylines on CityBeat’s pages. Perhaps we could grab a cup of coffee soon and discuss some of the issues that you feel most strongly about. In the meantime, I’ll be following your blog. Thanks, however, for the challenge. Then Dave emailed me again just the other day and told me I should check out their “Letters” section of their latest paper publication, the October 21st issue. I did – and discovered that City Beat had dedicated the entire issue to me. Wow! What an honor. Just because no one else but Dave and I (and a few others) knew about it, I didn’t care. Another badge of blogging honor. 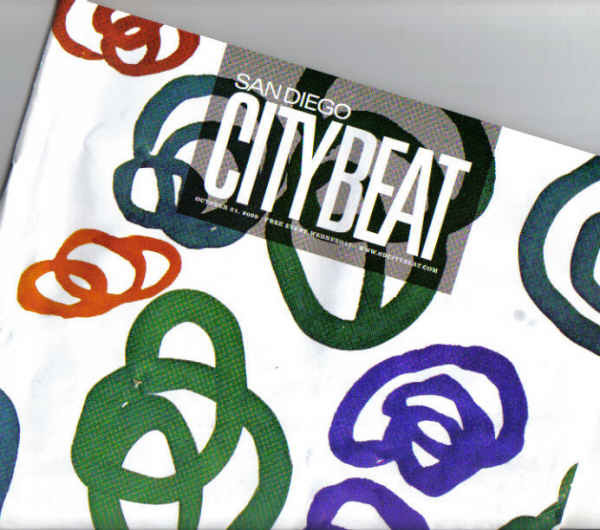 This issue of CityBeat is dedicated to Frank Gormlie, who welcomed new writer Dave Maass with a blog comment implying Maass is a know-nothing, carpetbagging, corporate hack. CityBeat Letters page, see hand-drawn red arrow. You can borrow my reading glasses. Hey, thanks Dave and the rest of you comedians. Here's your free PR. how can youze guys talk about this when Soupy Sales died last night? I would like to dedicate my entire post to Soupy Sales, who made pie-throwing acceptable and an art form. Soupy wants you to go to your mother’s purse and remove those green papers and send them to the OBRag…..
It’s not clear to me who made the decision to put that childish line there or whether Dave had anything to do with it (was there anything else in that paper issue or just that?). His email to you seemed polite but defensive, though I wonder if the management pressed him to write it. I do credit him with reporting on the SD Bay contamination legal action along with a copy of the lawsuit a day before the U-T published the story. Frank – I think you are valid in your complaints about out of towners being hired onto such influential publications. Still, considering the good humor and politeness with which you’ve been treated it also seems fair to give the guy a chance. CityBeat is my second source of news – behind the rag of course – and maybe this guy is just the kind of reporter they were looking for…..
anyway, i think its pretty cool you had a whole issue dedicated to you. congrats! Fun banter between you and Dave, Frank. Has it gone to your head? Kudos!!! Thanks Sunshine and Lane – Sunshine, when are we gonna hear from you again? Last post of yours gained you some followers. I’ve had a slow recovery process since I got out of the hospital recently. Working on regaining those creative juices as we speak. Sunshine – sorry to hear about that. Here’s to a speedy recovery. And a new post. Note to self: Proofread emails before you send them to bloggers. Anyway, I just wanted to clear something up. When I said I’d take it as a challenge, I meant I’d take it as a personal challenge to bring myself up to speed and earn the kind of respect Frank would bestow automatically upon a locally grown reporter. And as far as pricey jobs go…I don’t know what mediasphere the rest of y’all live in, but we all just eke by and report for the love it. I would’ve gone into patent law if cared about the money. George: No one pressured me to write to Frank. I just believe that when someone takes the time to provide feedback with valid criticism, it deserves a personal response. Time permitting, of course. You’re funny, dude. Didn’t know the job entailed having wit too. “Pricey” – I just threw that in, knowing I’d probably get a rise outta ya. No worries yo, I’m a dedicated local pot smoking myself…welcome to SD. If City Beat likes ya enough to bring you out here, odds are you’re a pretty good guy. Congrats for the mention, Frank! Congrats Frank, you sure are getting a lot of press lately! Hey did you all notice in that same City Beat issue that they ran Mary Mann’s “Playing with Fire” piece? Very Cool! The OB Rag, City Beat & the Reader are all that I read on a regular basis and I think they all compliment each other as well. Oh yeah, Revolt in Style should probably be in that mix as well. I like Dave Maass’ writing style and think he’ll fit in just fine here in America’s finest city. There’s certainly plenty to cover here so material shouldn’t be in short supply either. My only problem (yeah right) is that I’m just not certain as to how one would pronounce Dave’s last name. Bro, did something go horribly wrong on Wheel of Fortune where you were forced to buy an extra vowel? Thanks for the compliment. My piece this Wednesday should be a good read, too. Of course, it would be ideal to hire locally and not have to bring a new reporter up to speed on every local issue. But I believed Dave was the best fit for what we’re trying to provide for our readers. If you take “hire locally” to its extreme, no one would ever be able to leave home and experience other places. Just as Dave wouldn’t have been able to leave Phoenix, I’d still be in my personal hell in suburban L.A. Screw that noise. Thankfully, I’ve been able to do journalism in Chico, Marin, Ventura and San Diego—because people hire from outside the area. Only one member of our five-person editorial staff grew up here. I think CityBeat’s a pretty decent paper because of its editorial staff and contributing writers, most of whom also moved here from somewhere else. There are pros and cons to hiring local. The pros are obvious, but it’s also helpful sometimes to bring in people who can offer a fresh perspective on the town, see it through new eyes. I think you’re going to be pleased with the work Dave does here. I caught the dedication when I was reading this weeks issue of City Beat. It cracked me up. I’m glad to see there isn’t any lasting animosity. City Beat always does a fine job with their reporting, and Edwin Decker is one hell of a columnist and OBcean. Oh, no animosity at all. I don’t trust him. Who suggests a cup of coffee instead of a beer? Someone who doesn’t trust his balance on his scooter when driving with a beer in his system across town. Who is this uppity out-of-towner too good for the bus? Harumph, I say! Hey, hey – Back in Santa Fe, I was a constant consumer of public transportation. I’m meaning to do the same here, but jesus christ, are they gouging passengers with exorbitant fees. There’s actually an open meeting on the issue on Monday, which, if all goes according to plan, I’ll be using a bus to get ot. who drives around here? most obceans I know walk or bicycle everywhere. Minus that whole ‘job’ thing that takes me out of town most days, my car of choice is the Chevrolegs that get me around when at home (said job doesn’t pay enough for Lamborfeeties). New Dave – do some digging around here for some semi-recent takes on the woeful state of our local public transit system…if I recall correctly, I was looking to add 3 hours to and double the cost of my 12 mile commute by ditching my car last time I did the math. Being long gone from SD, I don’t know much about this issue of the CB hiring out of area reporters– I only remember the SD Reader had some great reporters in the 70s– but I do know that long- time reporters and citizens such as yourself do bring a background which no newbie could supply,—you know where the bones are buried–remember C.Arnold Smith & the SD Union? On the other hand, some newbies do bring a lot of new insights, energy, and experience– heck, I arrived in SD in ’72 and within a couple of years was right in the middle of the OBCPG struggle– but I respected the knowledge of experienced local folks like you and Tom Kozden. Maybe you and this Maas fellow may actually develop a symbiotic relationship to the benefit of SD and OB. But lets’ avoid that ugly charged word “carpetbagger” which suggested that Northerners were at fault for the failure of Reconstruction, when it was actually the local KKK types who destroyed the chance for real peace, freedom, and equality which Reconstruction and the winning of the Civil War had promised. It took us all another century to solve the racist mess they left. But again, Frank, congratulations for helping to keep the OB Rag alive. It is one of those institutions, like the OB Planning Board and our ( Veneta) Oregon Country Fair and Eugene’s Saturday Market which came out of the era of idealism and reform of the ’60’s and early ’70’s and survived to today. With Obama in the White House, all old Community Organizers should take pride. Cheers, Doug Card, Veneta/Eugene OR. Doug Card – what a trip hearing from you, dude! Doug worked with activists back in Community Planning Group days and with Common Ground, back in the mid-seventies. Doug ran for and was elected to the very first OB Planning Board. Yeah, thanks for reminding us about the term “carpet bagger”. My only defense is that I did not use it in my original comments to the City Beat. You’re always a true historian. Hopefully, you’ll come back again and comment more often. it’s so warm and fuzzy to hear all the opinions still being hurled around out there in my beloved OB. I miss you all. Frank you are are a sacred piece of history. justice : a shareing of intelligence on the downtown hankie pankie in city hall & elsewhere might be benificial to all. Norm – great to hear from ya, all the way from IB! I’ll let Doug know you came by…. Hey Donna, you have it right . . . Frank is a sacred piece all right . . . we should all write our recollections of his long life in OB. And being far away (though not as far as you I hear) it IS warm and fuzzy to see the OB life go on. And I hope you are really well and Randy and Tara too . . .
Hey Dickie, ,wow we are all still out there somewhere. R & T are well and doing fine. they are both in NC, near Kitty Hawk, a beach area. Just saw Tara, she is a wonderful, dear sweetheart. ,42 now. married, no kids. Randy, single, no kids either. I guess they didn’t want the responsibility, can’t blame them. & elsewhere. Keep up good work. I really like “This modern world” in the C.B.